A deadly experiment has been done in Berlin, 1945 that has the power to shake off humanity. Fast forwarding to the present, a drug mafia El Fantasma is decided to make Columbia a war place. DEA agents are into him but will they be able to put him behind the bars? INTERPOL agent Sabina Wytchoff’s story is nothing less than gripping. The endless search for the major villain of the story, Luc Fortesque’s perspective provides an emotional touch to the narrative. The author has mastered the art of jumping from one era to another with flexibility, without any hindrances. At one moment, you’re learning about the tragic incident occurred in Berlin in 1945, another moment you are ported in between the exciting events of Columbia, Naples and Africa. The book is a blend of multiple genres – action, thriller, historical fiction and science fiction. Many stories are fabricated with a lot of research and commitment. At the end of the day, each of these stories entangle into one, representing the imaginative prowess of the author. I especially enjoyed the names of the characters. They skyrocketed my reading experience. Douglas Misquita has pulled off a nice one here. Engaging narration proves the book to be a page-turner. With this work, the author has already given a tough competition to the established thriller writers. The Immorality Trigger kindles the memories of Narcos. Adventurous and thrilling are the two words that sum up this work for me. If you’re into Action Thrillers, Douglas Misquita’s books are a must check out. 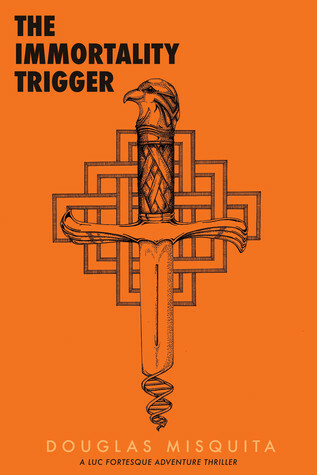 Sign into Goodreads to see if any of your friends have read The Immortality Trigger.